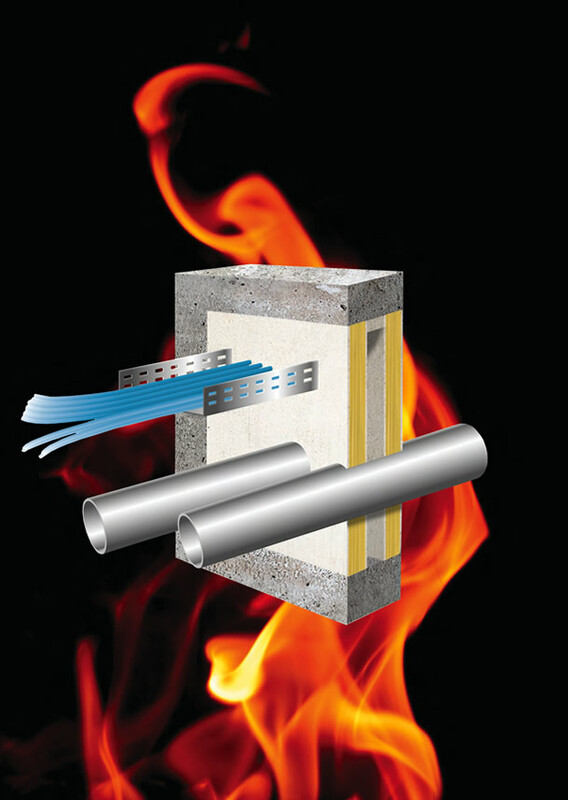 2MT HEATSHIELD B50 Fire Stop Batts are designed to restrict the spread of fire and smoke from one compartment to another where electrical and mechanical services penetrate through fire rated separating walls and floors, and can be used to seal complex large apertures. 2MT HEATSHIELD B50 Fire Stop Batts are high density fire resistant mineral fibre slabs, which are factory pre-coated with an ablative coating. Comprehensively tested and certified in accordance with BS EN 1366-3, BS476 pt 20, and other International Standards. 2MT HEATSHIELD B50 Fire Stop Batts are an extremely versatile and cost effective solution for a wide range of complex fire stop requirements, and are easily installed using basic hand tools. The Batts are simply cut to fit the aperture and are installed using 2MT HEATSHIELD C100 Fire Stop Coating and S500 Fire Stop Sealant. Up to 4 Hrs Fire Resistance. Comprehensively tested and assessed by independent authorities in accordance with BS EN 1366-3 , BS476 pt 20, for up to 4 Hours fire resistance. Can be used together with other products in the 2MT HEATSHIELD range as part of a flexible system for complex fire stop needs. Ideal for installation in fire rated walls. 2MT HEATSHIELD B50 Fire Stop Batts are suitable for use in any building which has services penetrating through fire rated compartment walls and floors. For Installation details please refer to relevant technical data sheets. How do HEATSHIELD B50 Fire Stop Batts work? When exposed to the elevated temperatures of fire conditions, 2MT HEATSHIELD B50 Fire Stop Batts provide excellent thermal performance and insulating properties. They provide a resistant and insulating barrier and prevent the spread of fire and hot gases from one compartment to another.